[caption id="" align="alignright" width="400" caption="The Boardwalk at Virginia Beach"] [/caption] Virginia Beach in the summertime… now that's paradise. Miles of wide, sandy beaches, a boardwalk bustling with activity, abundant outdoor recreation, and a rich history - Virginia Beach offers this and more. It has been said that the only way to fully experience all Virginia Beach has to offer is to live here. While that may be true, the next best thing is to make yourself at home in a Virginia Beach Bed and Breakfast. Knowledgeable innkeepers can provide useful tips on what to do, when to do it, and where to eat. Whether you are interested in a holiday full of paddling, biking, and jumping waves or one that explores the interesting culture and history of the area, your innkeepers can help orient you to Virginia Beach. 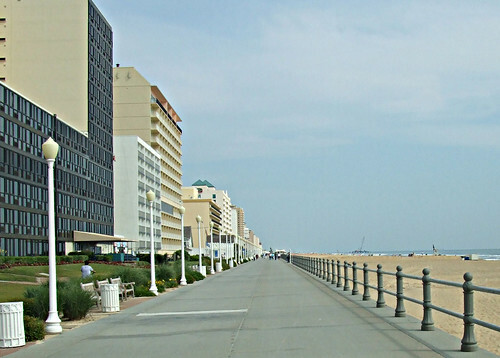 It is difficult to imagine visiting Virginia Beach without at least one trip to its historic Boardwalk. Originally built out of wood to span five blocks in 1888, it has experienced more than one renovation. Today it is three miles long, 28-feet wide, and has a separate bike path, making it a safe place for folks to bike, rollerblade, and walk. The boardwalk is dotted with shops, outdoor restaurants, and food vendors - you may want to look at them all before you decide where to dine. There are four wooden walkways extending from the main Boardwalk down to the beach, so it is easy to stretch out on the sand or jump in the water. During the summer, outdoor stages near each beach access are a nightly source of great entertainment. It's fun to walk the length of the boardwalk, hand-in-hand, listening to the music fade from one stage as it grows from the next. Visit the Boardwalk once or stop by every evening after a day full of outdoor recreation. The Sandbridge Beach area offers five miles of secluded beach and sand-dunes. It is close to the Back Bay National Wildlife Refuge and False Cape State Park, which are both ideal spots for hiking, fishing, and paddling. Gentler waves are found on the beaches of nearby Chesapeake Bay. There is golf in Bayside and cycling at numerous Sate Parks throughout the Virginia Beach area. Ask the innkeepers of your Bed and Breakfast Virginia Beach for the best cycling routes near the inn. In can be as much fun to visit the many interesting historical sites around Virginia Beach as it is to get out in the surf. The Adam Thoroughgood House, in Bayside, is one of the oldest extant homes from the Colonial period, dating from 1680. The Lynnhaven House in Little Neck is a beautiful brick building built in 1725. No matter how you most like to spend your time, you'll be pleased by the breadth and variety of activities in the Virginia Beach region. If you can't make it there this summer, we will welcome you in the fall.